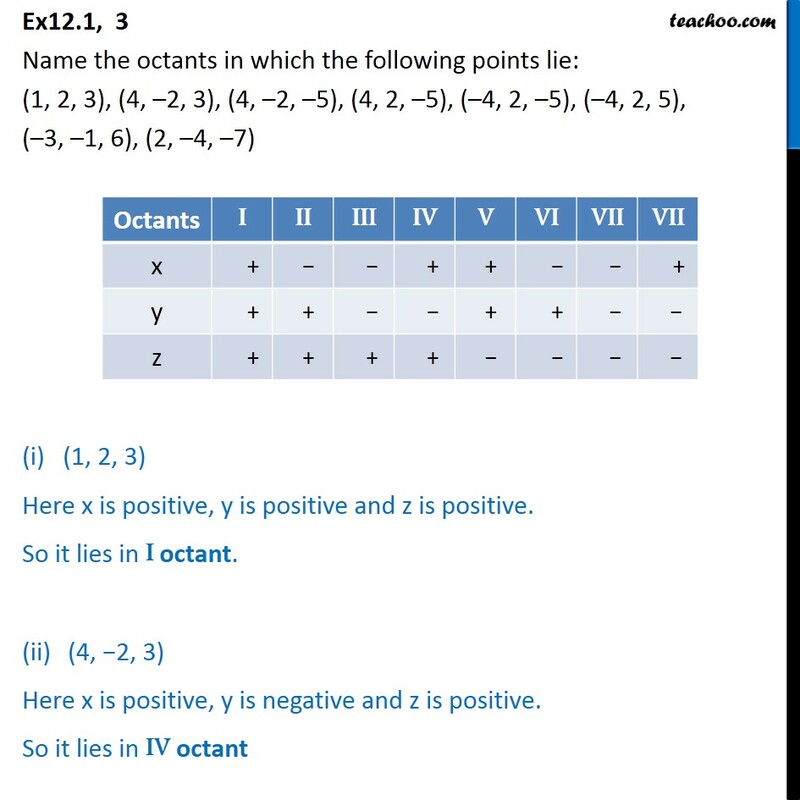 Ex12.1, 3 Name the octants in which the following points lie: (1, 2, 3), (4, 2, 3), (4, 2, 5), (4, 2, 5), ( 4, 2, 5), ( 4, 2, 5), ( 3, 1, 6), (2, 4, 7) (i) (1, 2, 3) Here x is positive, y is positive and z is positive. So it lies in I octant. (4, 2, 3) Here x is positive, y is negative and z is positive. So it lies in IV octant (iii) (4, 2, 5) Here x is positive, y is negative and z is negative. So it lies in VIII octant (iv) (4, 2, 5) Here x is positive, y is positive and z is negative. So it lies in V octant. (v) ( 4, 2, 5) Here x is negative, y is positive and z is negative. 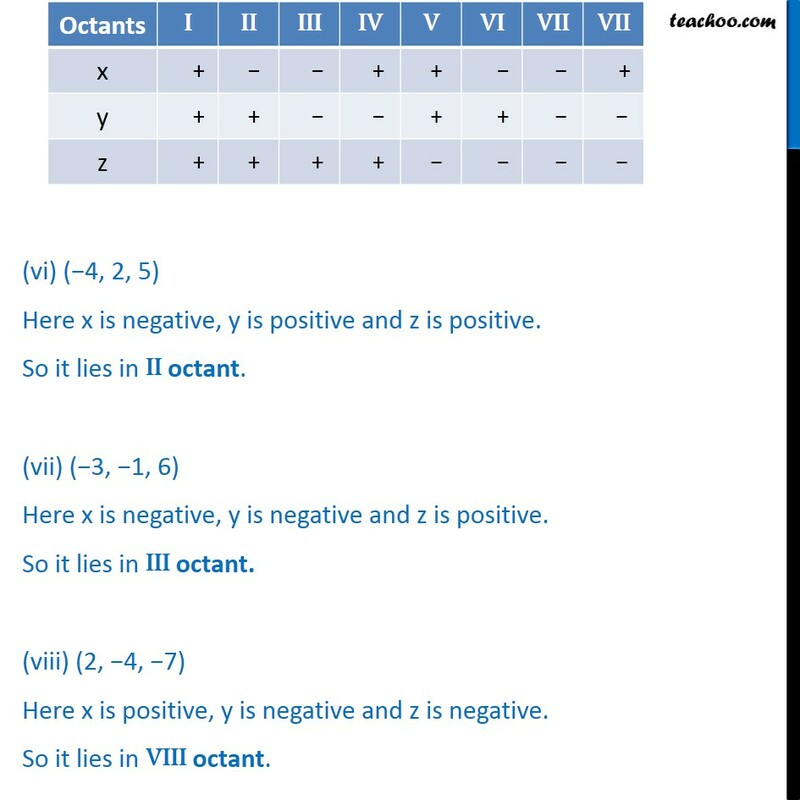 So it lies in VI octant (vi) ( 4, 2, 5) Here x is negative, y is positive and z is positive. So it lies in II octant. (vii) ( 3, 1, 6) Here x is negative, y is negative and z is positive. So it lies in III octant. (2, 4, 7) Here x is positive, y is negative and z is negative. So it lies in VIII octant.